An Authentic Log Home is the perfect choice if you value quality, affordability, and truly personal custom design. We will work one-on-one with you throughout the entire home design process, and we will be here when you have questions and concerns after the sale. This truly separates us from the competition. We don't sell many homes a year, but the homes we do sell are the dreams and inspiration of our customers. We will work with you and your builders, contractors, and/or architect/s to help create the log home of your dreams. This custom design and personal attention comes at no extra cost and enables us to help you match the home of your dreams with your budget. 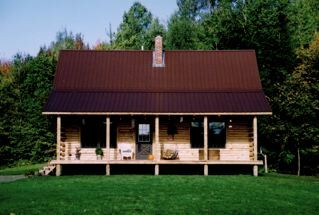 There are two typical Authentic Log Home packages to choose from: shell or complete. • A shell package consists of your homes exterior walls, a roof system, doors, and windows; which allows you to erect a shell of a home this is closed against the elements. • A complete package is everything included in the shell package plus interior walls, floors, doors, stair systems, insulation and more. - View the Log Packages page for a table fully outlining the two package options. Once you decide on a log package, you will need to choose a log type, size, and profile style. • Styles: Hand Drawshaved D-Profile, Milled Contour D-Profile, or Milled Contour Round-Profile. - View the Log Type & Style page for detailed options. 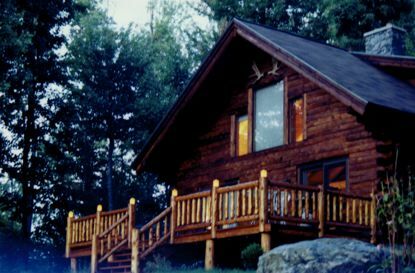 We offer PELLA® brand doors and windows for our log home packages. • Architect Series - Elegant, distinctive detailing and virtually unlimited design possibilities. • Designer Series - Exclusive snap-in between-the-glass window fashions that provide unmatched convenience. • ProLine Series - Basic and beautiful to maximize your value. We also offer VELUX® skylights and Therma-Tru® exterior doors. - View the Windows & Doors page more detailed information. We consult with you and help you make the choices that best fit your needs, skill, and budget. Contact us and/or Request an Estimate Online.